Also, “Haydn” Variations; Alto Rhapsody; Academic and Tragic Overtures. Otto Klemperer, Philharmonia Orchestra. EMI 7243 5 62760 2 8 (3-disc set). Two prefacing comments: (1) I am not the biggest fan of the Brahms symphonies, my appreciation limited to the final movement of the First Symphony, much of the Second Symphony, little but parts of the opening and third movements of the Third Symphony, and most of the Fourth Symphony. (2) I am a fan of Otto Klemperer, whose command of the basic Germanic repertoire--Bach, Beethoven, Brahms, Bruckner, Mozart, Mahler, Mendelssohn, and Wagner--I find largely unequalled (well, OK, except Bach). Klemperer is, along with Bruno Walter and Sir Adrian Boult, the only conductor who can make the parts of the Brahms symphonies I enjoy come alive for me. That said, I welcomed with open arms a few years ago this three-disc set of remastered Klemperer Brahms from EMI in their “Great Recordings of the Century” series. These works by Brahms were among the first things Klemperer recorded when he took over the Philharmonia Orchestra from Herbert von Karajan in the late Fifties. They showed him to be a towering figure on the podium, who enjoyed the respect of music lovers for the next two decades as he had for a half century before. Now he gets their respect through his many recordings. The three discs in the set include not only the four symphonies but the Haydn Variations, the Alto Rhapsody (with Christa Ludwig), and the Academic and Tragic Overtures. Klemperer’s way with the First Symphony is as granitelike as always, yet the music flows almost unconsciously from his direction. The famous march tune in the Finale is, of course, as prominent as ever and crowns the work for the heroic tones that precede it; but even the prior three movements show the power and conviction of both Brahms and Klemperer. The conductor clarifies points a listener might not know existed by presenting the music as directly yet as profoundly as possible. People criticized the conductor early in his career for being too literal with his interpretations, but by 1957 the world had caught up with him and recognized his genius. Frankly, though, I hadn’t heard these recordings since their old LP days, and was expecting the worst. It didn’t happen. While I remain largely unconvinced the Brahms symphonies represent the greatest music in the world, I enjoyed every minute of them. 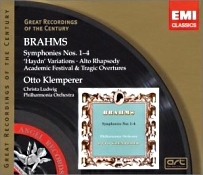 Folks often consider the Second Symphony Brahms’s “pastoral” symphony because of its often casual and bucolic manner, and certainly Klemperer brings out these qualities. His is a more angular vision of the piece, however, than Boult’s more romanticized and curvacious rendering. Still, Klemperer’s way with the Second is lovely and serene, building to a nice climax in the energetic final movement, which tends to be perhaps a bit too rowdy for the nature of the preceding movements but blame that on Brahms, not Klemperer. Although audiences had to wait six years for its appearance, the Third Symphony takes up where the “Pastoral” Second left off. But it is perhaps even more personal, and especially pastoral in its middle sections, with familiar and graceful tunes in the first and third movements. Klemperer seems surprisingly gentle in molding the inner sections while standing typically firm in the outer ones, the payoff being a reading of the Third more appealing than any I’ve heard. Despite my initial reservations about the work, listening again to Klemperer, poetic yet strong, makes me think no one may match his performance. The Fourth is probably Brahms’s most wholly satisfying symphony, with much of it standing up well to repeated listening. The opening movement begins most gracefully and builds in drama using some of the composer’s most memorable tunes. The second movement is as placid as ever, and its heart is in the right place. The third movement Scherzo is cheerful, festive, and exuberant, leading to a powerful and relatively serious Finale. 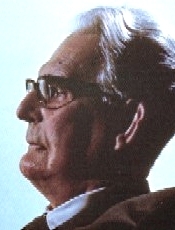 Klemperer’s manner is more severe in the Fourth Symphony than many of his fellow conductors like Blomstedt, Walter, or Abbado, with Klemperer driving the music more steadily forward until each movement culminates in the appropriate degrees of joyfulness or excitement. Not everyone will respond positively to Klemperer’s approach, but it is a feasible alternative to many of the more spontaneous but often more sentimental interpretations of his rivals. The sound in all the works is quite good for its age, although if played at a high volume there is a small degree of background noise one can note. At normal volume, the sound is quiet enough, though. The recording dates range from 1954 for the “Haydn” Variations, a mono recording, to 1962 for the Overtures, with Klemperer having recorded the symphonies in 1956-57. EMI remastered and noise-shaped them in 1999 (releasing the present compilation in 2004) using the Abbey Road Technology Prism SNS system (ART), but an even newer remastering might have rendered the First Symphony, particularly, even quieter. The mono Variations are actually the most transparent, but the others are in good-sounding stereo. In fact, several of my favored Boult recordings disappointed me when I put them on for comparison; they sounded rather plump, overly plush, alongside the decade-older Klemperer things. Oh, well. Maybe it’s time EMI remastered and cleaned up the Boult discs, too. Anyway, the Klemperer recordings display a wide stereo spread, good dynamics, and a satisfying low-end thump. What’s more, the sound stage often appears deep and three-dimensional, the sound quite natural in every respect except perhaps the highest violins, which tend to be a bit hard. I have already enjoyed this set immensely for several years and will no doubt continue to do so for a very long time.